Composition: sucrose bacteria and Bacillus Subtilis strain VKPM B-7092, Bacillus Licheniformis strain VKPM B-7038 of not less than 10 million. Spores per pill. Product: Packaging 50 tablets of 0.5 grams. the drug inhibits the growth and development of chlamydia. The Probiotics Vetom 3 (caps) dosage and application. For treatment 3.1 Vetom receive individually a rate of 1 tablet per 10 kg of body weight per day. Dose divided into 2-3 doses. Take with or without food, drinking a small amount of liquid. 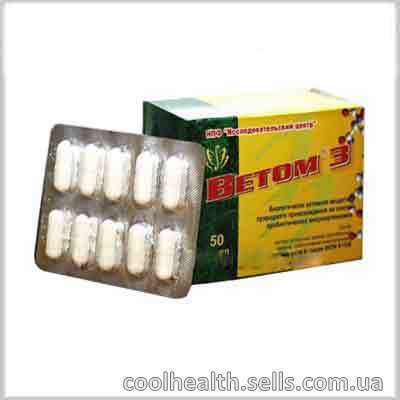 For preventation 3.1 Vetom take 1 tablet per 20 kg of body weight per day. Dose divided into 2-3 doses. Take with or without food, drinking a small amount of liquid. Duration of use: apply Vetom 3.1 must be made within 10 days. Not recommended: taken with antibiotics, because effect of the drug is greatly reduced or absent.